After a five-minute delay in the wake of Fresno State's apparent inning-ending, bases-loaded triple play against Cal Poly Pomona wherein the batter-runner circled the bases and touched home plate after the defense had left the field, umpires ordered the clubs back onto the field and placed the batter-runner at second base. What happened? A batter-runner scores with no defense in sight. The Play: With none out and the bases loaded, Cal Poly batter Connor Gurnik hit a ground ball to Fresno State third baseman Tatum McCarthy, who stepped on third base ahead of baserunner R2 Myles Emmerson's arrival, and threw to second base ahead of baserunner R1 Dylan Doherty. Fresno's subsequent throw to first base to attempt to retire batter-runner Gurnik was wide of the base and eluded first baseman Zach Presno, who retrieved the throw as he spied a runner racing toward home plate, throwing on to catcher Carter Bins, who tagged the runner, mechanized as an out by the plate umpire, for the apparent third out of the inning. As Fresno State left the field and celebrated the assumed triple play, batter-runner Gurnik continued running the bases, eventually arriving at home plate, after which HP Umpire Hal Simons, 1B Umpire Dwayne Finley, and 3B Umpire Bob Williams met to discuss the play. Ruling: Let's recap the play by umpiring decisions based on player actions. To begin, we have a bases-loaded, none-out ground ball to third base. Because the batter has become a runner, R1, R2, and R3 are all forced to advance. After fielding the batted ball, F5 steps on third base, forcing out R2 for Out #1. F5 then throws to second base, whereupon baserunner R1 is forced out for Out #2. When the subsequent throw to first base eludes the first baseman, the batter-runner safely arrives at the base. F3 then spies a runner breaking for the plate and throws home to F2, who instinctively tags this runner. However, this runner is R2, who was previously forced out at third base. The throw gets away at first base. R2 Legally Continued to Run the Bases: NCAA and OBR agree that a recently retired runner is allowed to continue running the bases in the sense that this runner should not be declared out for interference for simply running the bases after being put out. NCAA Rule 5-3.Note 1: "If the batter or runner continues to advance after being put out, that act alone shall not be considered as confusing, hindering or impeding the fielders." OBR 6.01(a)(5) Comment: "If the batter or a runner continues to advance or returns or attempts to return to his last legally touched base after he has been put out, he shall not by that act alone be considered as confusing, hindering or impeding the fielders." Remember that MLB changed the rule to add "or returns" after the following 2017 play at Fenway. Related Post: Boston Files Protest Over Odd Interference No-Call (7/15/17). Umpire calls R2 out at home plate. Thus, we have a potential opportunity to invoke NCAA Appendix E / Getting the Call Right, which allows umpires to convene if an umpire's "view is blocked or positioning prevents him from seeking crucial elements of a play. An umpire is also encouraged to seek help in instances when he has any doubt and a partner has additional information that could lead to the proper ruling" (E-1-b). This could also be treated as a Rule 3-6-i situation: "When two or more umpires render different decisions on the same play, the umpire-in-chief shall consult with all the umpires away from all players and coaches. The umpire-in-chief shall determine which decision shall be accepted." The two decisions here would be R2 out at second, by U3, and R2 out at home, by UIC. R3 runs home as F5 throws to second base. SIDEBAR: How do we know the third baseman tagged third base? Because if he didn't tag third base, and the plate umpire's out call was the only out call on R2, then the batter-runner would have been permitted to score. Instead, it can be said the defense only left the field due to the erroneous third out mechanized by the plate umpire on a runner-already-retired. In this situation, it's possible our plate umpire didn't see the force out at third, and it's also possible the excitement of a play at the plate after a wild throw to first base caused the umpire to lose sight of R2; alternatively, it's generally instinct to simply punch out a runner tagged out on a very close play. Whatever the reason, this was an extra "out" call and the defense, also lost as to R2's previous retirement, incorrectly treated the out at home as a third out, and left the field. The only player who seemed to know there were only two outs was the batter-runner, who circled the bases and touched home plate before the umpires convened under the auspices of Appendix E.
F2 celebrates before any call is made on R2. Placement of Runners: When it comes to runner placement, umpires are afforded great latitude, while Appendix E-1-c.Note, relative to correcting a foul/fair call states, "The Crew Chief and crew should be conservative on their placement of base runners." E-2-h, which does not directly apply here but whose language is relevant, states, "If the reversing of a call results in the need for decisions on the placement of base runners, the crew chief shall use his best judgment to determine their locations as if the call had been made correctly (with exception to placement prescribed by rule on catch/no catch reversals)." 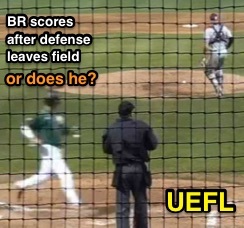 HOWEVER, notice that F2 begins celebrating and runs off the field before the plate umpire has made a call. Accordingly, it could be argued that had the plate umpire never called R2 out (for a second time), the defense would have still left the field, allowing the batter-runner to score. This, ultimately, is a matter of umpire judgment in the spirit of fair play. OBR's guideline, per Rule 8.03(c), is somewhat similar: "If different decisions should be made on one play by different umpires, the umpire-in-chief shall call all the umpires into consultation, with no manager or player present. After consultation, the umpire-in-chief (unless another umpire may have been designated by the League President) shall determine which decision shall prevail, based on which umpire was in best position and which decision was most likely correct. Play shall proceed as if only the final decision had been made."